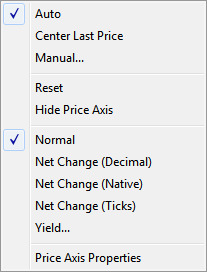 Right-click the vertical price axis to access the price axis context menu. Auto: Adjusts the scales to new highs and new lows beyond the highest high and lowest low in the visible time series when checked. Center Last Price: Centers the chart on the last traded price which is highlighted. Manual: Displays the Set Price Scale dialog box. 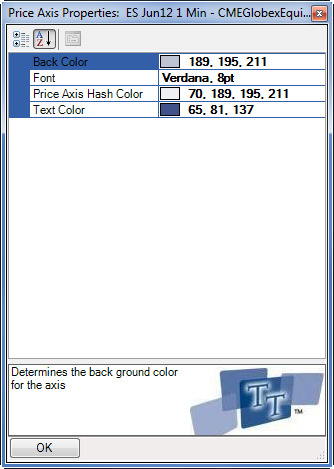 Right click the vertical price axis and click Manual. In the Maximum field, click the up and down arrows to set the highest price viewable on the vertical axis. In the Minimum field, click the up and down arrows to set the lowest price viewable on the vertical axis. Click OK to apply the new settings. You successfully set the price scale. Reset: Returns the price axis to its original view. Hide Price Axis: Removes price axis from view. Normal: Shows available prices for the instrument or spread. Yield: Displays the Yield Properties menu, allowing you to configure the Price Axis to show Price as Yield or Yield to Maturity options. Price Axis Properties: Lets you change the appearance of the price axis.